The real penalty, in both games, is that you end up covering familiar ground to get back to where you were when you failed. And here again there's not much difference between the two. Prince of Persia's flat surfaces are fairly evenly spaced, as are Mirror's Edge's checkpoints. I spent about as much time falling and repeating sequences as the Prince as I did when I was in Faith's shoes. So what's really driving the complaints about how Prince of Persia and Mirror's Edge deal with failure? It must be gamers' gut-level reactions to what failure in each game means from a symbolic perspective. For some players, the sense of total failure that accompanies Faith's dramatic deaths outweighs the sense of relief and accomplishment that they feel when she finally makes it to the next checkpoint. And, by comparison, Elika's constant lifesaving presence must make the Prince feel a lot less heroic and death-defying to some. These emotional reactions apparently run deeper than practical considerations. Interestingly enough, they also outweigh thematic concerns that seem equally important. In Mirror's Edge, Faith lives or dies by her own wits and abilities as she's pursued, alone, by a hostile society. It's a bleak world where one misstep has terrible consequences and the fatal results of Faith's mistakes underscore this theme in a powerful way. 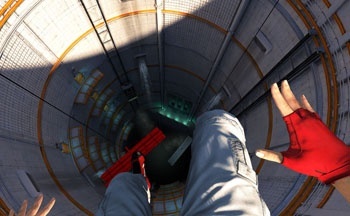 A deathless or forgiving approach to mistakes would feel wholly out of place in the world of Mirror's Edge. Ubisoft's decision to make Elika the Prince's safety net has even greater thematic relevance. By giving the relationship between the Prince and Elika critical gameplay importance, the developers weren't just eliminating player frustration. They were cementing the nature of that relationship and providing a basis for character development. Each time the player experiences Elika's lifesaving grasp, the game underscores its central themes of loyalty, cooperation, and companionship. I wasn't troubled by either game's approach to failure, but this isn't to say that those left wanting by Mirror's Edge or Prince of Persia are in the wrong. We all look for different things in different games, and in the end what really matters is whether or not a game delivers on a gut level. I do think it's important to remember, though, that there's often more to game design decisions than meets the eye. I've certainly been guilty of maligning games because they didn't meet my preconceived notions of what they should or shouldn't be in some minor respect. But when you're overly focused on minutia, it's easy to overlook the big picture. In the case of Mirror's Edge and Prince of Persia, I think some gamers and critics can't see past their own emotional responses. Both games deserve praise for dealing with failure in ways that are critical to the stories they tell. Gamers who can't appreciate the wisdom and larger meaning behind those design choices may be missing the forest for the trees.